The majority of lymphomas originate from B cells at the germinal center stage. 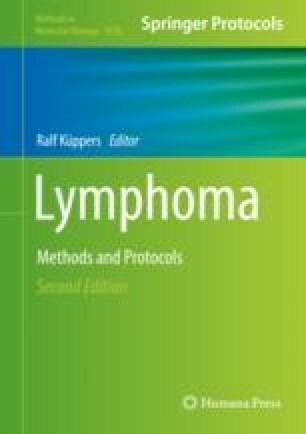 Preferential selection of B-cell clones by a limited set of antigens has been suggested to drive lymphoma development. While recent studies in chronic lymphocytic leukemia have shown that self-reactive B-cell receptors (BCR) can generate cell-autonomous signaling and proliferation, our knowledge about the role of BCRs for the development or survival of other lymphomas remains limited. Here, we describe a strategy to characterize the antibody reactivity of human B cells. The approach allows the unbiased characterization of the human antibody repertoire at single-cell level through the generation of recombinant monoclonal antibodies from single primary human B cells of defined origin. This protocol offers a detailed description of the method starting from the flow-cytometric isolation of single human B cells to the reverse transcription-polymerase chain reaction (RT-PCR)-based amplification of the expressed immunoglobulin (Ig) transcripts (IGH, IGK, and IGL) and their subsequent cloning into expression vectors for the in vitro production of recombinant monoclonal antibodies. The strategy may be used to obtain information on the clonal evolution of B-cell lymphomas by single-cell sequencing of Ig transcripts and on the antibody reactivity of human lymphoma B cells.